A new open access article by ESID researchers Giles Mohan, Kojo Asante and Abdul Gafaru Abdulai has just been published in New Political Economy. Ghana’s status as a new oil producer raises questions about the developmental effects of resources, and the role of political institutions in these processes. The conundrum this paper addresses is the rather limited impact of oil exploitation in Ghana, despite the country’s strong democratic record and internationally acclaimed oil governance legislation. The reasons for this lie in the nature of elite-based political coalitions, and we root our analysis of Ghana’s hydrocarbons in the political settlements literature, which moves us beyond the ‘good governance’ approaches so often linked to ‘resource curse’ thinking. We also move beyond the instrumentalism of political settlements theory to examine the role political ideas play in shaping resource governance. We argue that inter-coalitional rivalry has generally undermined the benefits of Ghana’s oil, but that a crude interests-based interpretation is insufficient to explain differences between these coalitions. 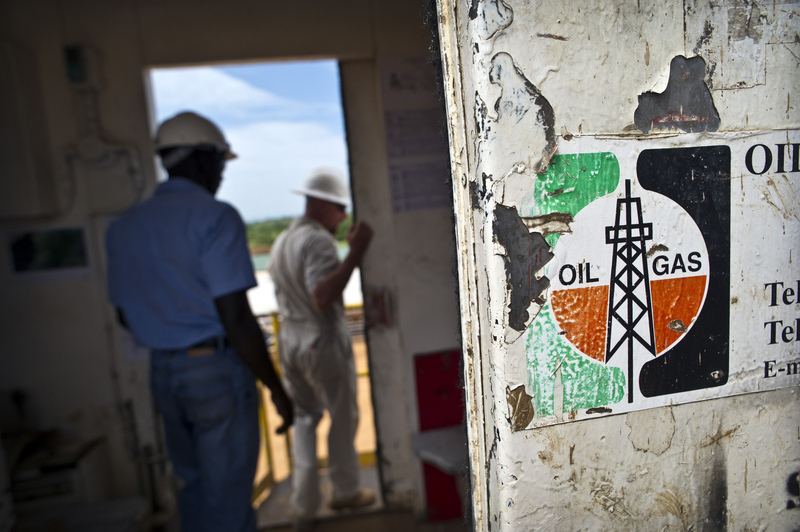 Workers at Kigogole oil field, drilling site of Tullow Oil. Read more research on the politics of oil in Ghana and Ugandan here.